The Markley Agency was established in the late 1940's and was later sold to Fahl Keister. 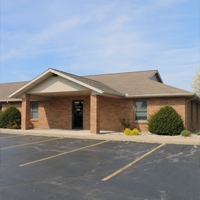 The agency went through several changes and was later name Rick Keister Insurance in the 1970's. In 1990 June Keiser, an employee, bought the agency along with Jacqueline Worrick. The name was then changed to J & J Insurance Solutions. In May 2015 the agency was sold to Benjamin Schoettmer and David Callahan of Hughes Insurance Group. Jacqueline and June remained a part of the agency, which continued under the name J & J Insurance Solutions. Merritt L Norris Insurance was started in 1945 in the home of Merritt & Catherine Norris on Front St. in South Whitley, IN. In 1956 Merritt built a new office on State St. where they became known for the drive up window Merritt had installed that allowed customers to drop off payments or documents without leaving their car. In 1975 Dennis Norris, Merritt Norris’ son, started working in the office and has been working in the agency ever since. The agency was acquired by Hughes Insurance Group in April of 2017. Dennis Norris remains as an active part of the team.